We've all heard the old saying, "Be careful what you wish for, because you just might get it". I'd be willing to be that this adage is even true in Hollywood, where dreams are made and everyone is chasing success. When a new television show starts, it's safe to assume that the creators want it to be a success. But, what happens when the show actually is a success and the network demands season after season? What do you do when you weren't prepared to create years of stories for your characters. This is where terms like "jump the shark" come in, as many series fail to grow and change. Those which do, such as The Big Bang Theory, continue to enjoy year after year of success. In the event that you aren't aware, The Big Bang Theory, centers on four scientists who live in Pasadena, California. Leonard (Johnny Galecki), a slight neurotic, but good-hearted guy, lives with Sheldon (Jim Parsons), an obsessive-compulsive know-it-all, who have few social skills. They are friends with Howard (Simon Helberg), a mama's-boy who thinks that he's a ladies man, and Raj (Kunal Nayyar), a metro-sexual who is prone to getting his feelings hurt. In the beginning, the show focused on the nerdy pop-culture things that they guys loved and the fact that they got nowhere with women. This all changed when Leonard fell in love with Penny (Kaley Cuoco-Sweeting), an actress who lives across the hall. This was eventually requited and their relationship grew. Howard found himself attracted to Penny's co-worker, Bernadette (Melissa Rauch), and they began to date and eventually got married. As a joke, Howard and Raj entered Sheldon into a dating website, which is how he met Amy Farrah Fowler (Mayim Bialik) and they became...something. Finally, last season, Raj begin seeing dermatologist Emily (Laura Spencer). At the end of Season 7, Leonard and Penny had been discussing taking their relationship to the next level and moving in together. At the same time, Sheldon decided to change his field of study. These two events threw Sheldon into a spiral and he decided to basically run away from home and tour the country by train. As Season 8 opens, Sheldon returns from his trip, much to the relief of Amy. Leonard agrees to not move out immediately, in order to give Sheldon a chance to deal with it. This does lead to a discussion of when the now engaged Leonard and Penny are actually going to get married. Speaking of which, Amy continues to work on Sheldon in attempts to advance their relationship. Raj is glad to be in a relationship, but he realizes that Emily scares him. Howard is attempting to deal with the fact that Stuart (Kevin Sussman), who moved in with Howard's mother after his comic book store/home burned down, refuses to leave. As noted in the second paragraph, The Big Bang Theory has changed over the years, going from a niche show to something more complex. Don't get me wrong, I loved the show when I first discovered it, and as someone who is very into pop-culture (although I would not consider myself a nerd), it was fascinating to hear comic books and semi-obscure movies discussed on a prime time network show, on CBS no less. While the characterization leaned a little too much on stereotypes, the guys were relatable, and Sheldon certainly became a breakout star. I've read comments from viewers who state that the show has changed too much over the years. I disagree. If The Big Bang Theory had continued on being solely about how nerdy the guys are, it would have burned out years ago. The idea was (semi) unique at first, but watching this quartet simply talk about movies and how they are lonely would have eventually gotten very depressing. The shift to more of a relationship-driven show could be seen as a ploy to bring in more female viewers, but whatever the case, it has made the show's longevity much more justifiable. For the open-minded viewer, the inclusion of more female characters has only enhanced the show. I wasn't much of a fan of Mayim Bialik in the past, but I find Amy to be hysterical, especially when she says something slightly dark. Melissa Rauch always brings a ton of energy to her role and the scenes where Bernadette and Howard fight are funny. The only weak link is Penny. Cuoco-Sweeting has never been a good actress, and it seems that of late, Penny has lost any humility that she may have once had and Cuoco-Sweeting acts as if the show revolves around her. Of course, the most growth has occurred with Sheldon. Realizing that a character who is abrasive all of the time would lose his appeal, the writers on The Big Bang Theory have softened Sheldon up a bit over the years, mostly due to his interactions with Amy. He's still just as eccentric as ever and his judgmental quips are often the highlight of the show. Making Sheldon more human actually makes his non-PC statements even funnier, as they seem to come out of nowhere. The point here is that Season 8 of The Big Bang Theory presents us with a show which is still funny and impressive even after being on the air for nearly a decade. We've watched these characters grow and we are very comfortable with them. More importantly though, the writing on the show has remained very fresh. They may be examining some of the same things over and over, but the jokes are funny and that's what a sitcom wants to be, right? The Big Bang Theory: The Complete Eighth Season contains a great Three Little Pigs joke on Blu-ray Disc courtesy of Warner Home Video. The two disc set contains all 24 episodes from the show's eighth season. The show is letterboxed at 1.78:1 and the Disc contains an AVC 1080p HD transfer which runs at an average of 18 Mbps. The image is very sharp and clear, showing no notable grain and no defects from the source materials. The colors look very good and the image is never overly dark or bright. The level of detail is good and the picture is never soft. This certainly rivals HD broadcast quality. The Disc carries a DTS-HD Master Audio 5.1 track which runs at 48 kHz and an average of 2.2 Mbps. The track provides clear dialogue and sound effects. Despite the fact that I've seen them over and over, I often watch reruns of the show. I was watching on right before I put on the Blu-ray and immediately noted the difference in sound. The sound from the Disc is much crisper and it's much more detailed. The dynamic range allows for more stereo effect and the "woosh" during the transitions offers nice bass. 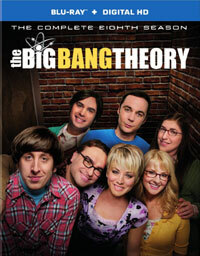 The Big Bang Theory: The Complete Eighth Season Blu-ray Disc contains a nice selection of extras. Disc 1 kicks off with "Shooting Stars: BBT on BBT" (5 minutes) takes us behind the scenes on "The Misinterpretation Agitation" to examine the episode in which Billy Bob Thornton makes a guest appearance. Thornton explains why he came on the show and the entire piece is composed almost entirely of on-set footage. (It's really weird to hear Melissa Rauch's real voice.) "2014 Big Bang Theory Comic-Con Panel" (28 minutes) opens with Garfunkel & Oates, which wasn't good for me, as I can't stand 50% of this duo. (I'll let you decide which one.) This is comprised mostly of the creative team from the show, with Wil Wheaton being the only actor appearing. Moderator Craig Ferguson leads the group through many interesting question about the process of creating the show. As we move to Disc 2, we find "It's a Quark...It's an Atom...It's the #BBTSuperfans" (12 minutes) profiles a group who participated in an online trivia contest and won the prize of attending a taping of the show. "Constellation Prize: Chuck, Jim & Kaley Make the Hollywood Walk of Fame" (4 minutes) show a group from show getting their stars. (Galecki doesn't?) "Here's to You, Carol Ann Susi" (10 minutes) is a tribute to the actress who never appeared on-screen but became famous for providing the voice of Mrs. Wolowitz, with the cast & crew reminiscing about her. We end with a 7-minute GAG REEL.